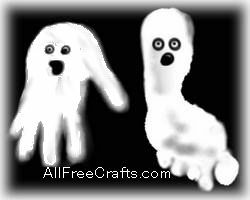 This is an easy way to get your toddler or preschooler involved in the Halloween festivities – have them make hand and footprint ghosts to decorate your home, or scan the original painting and resize it to use as Halloween party invitations. With a paint brush, or cotton balls, apply paint your child’s hand in washable white paint and have them press the painted hand down on a sheet of black construction paper. Experiment to see if you prefer your ghosts with a straggly bottom (open fingers) or a more formed look (fingers held together). Repeat the painting application with your child’s foot (be careful not to let the paint brush tickle too much). Place the construction paper on the floor and let your child stand the painted foot on the sheet of black construction paper. Make a simple ghost face with black markers – two eyes and a mouth. Let the painting dry and hang to display, or scan it and make copies to send to grandparents or use as party invitations. If time or conditions don’t permit a painting session, try outlining your child’s footprint on white paper, then drawing in ghostly eyes and a mouth with crayons.